The 47,000 Commerce employees, Wilbur Ross said in a speech at the National Press Club, “are capable technically, non-ideological and, even with the trapezoid pay structure, are very willing to work late at night and on weekends” (as some did in preparing the speech he delivered, focused mostly on trade tensions with China and Europe). Ross waved aside an audience member’s question about the ethics of his delayed divestment of his former private-equity firm’s seven-figure holdings in the natural gas tanker shipping firm Navigator Holdings. It is reputed to be owned in part by figures with ties to the Russian oligarchy and Chinese-government-linked firms. “The ethics office did not require divestiture,” Ross said, but he divested well before the sanctions against Russia took effect on April 8. The secretary defended the Trump administration’s much-debated decision to restore a citizenship question to the census questionnaire being prepared for 2020. He also confirmed that he has recommended a nominee for the Census director slot vacated a year ago by John Thompson, and that nominee awaits White House approval. 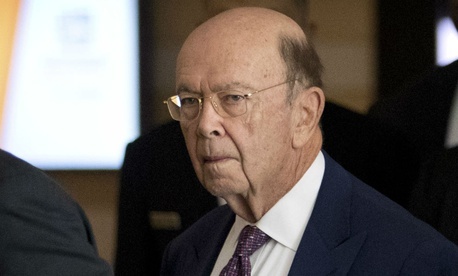 The benefits of the controversial citizenship question, Ross said, outweighed the fears that including it would suppress response rates in immigrant-heavy communities. “61 million families have already been exposed to the citizenship question” via the annual but smaller-scale American Community Survey, he said. To boost participation, the bureau plans to spend $500 million on advertising, offer questionnaires in 12 languages (English and Spanish on all versions), work with community centers and hospitals to do outreach, and provide multilingual help in call centers, he added. The risk that the citizenship data would be used for immigration enforcement or other such questionable purposes is low, he said, given that the law restricting its use—Title 13—has never been violated, and because Census employees with access to the data sign a lifetime oath of confidentiality and risk four years in prison and a $250,000 fine for violating the oath. Ross said he is most excited about Commerce becoming “one-stop shopping” for commercialization of space. Tourism, the mining of asteroids, colonization and using the Moon as a fueling stop for a Mars expedition “are coming sooner than you think,” he said.